We have gotten an ASUS GeForce GTX 960 STRIX to test GPU mining with it and also checked the power usage with the various algorithms supported by the latest ccMiner fork from SP that is optimized for Nvidia Maxwell GPUs. The ASUS STRIX is one of the GTX 960 video cards out there with the highest factory overclock, so it is supposed to provide higher performance as compared to the more reference Palit GTX 960 OC card that we have tested recently. 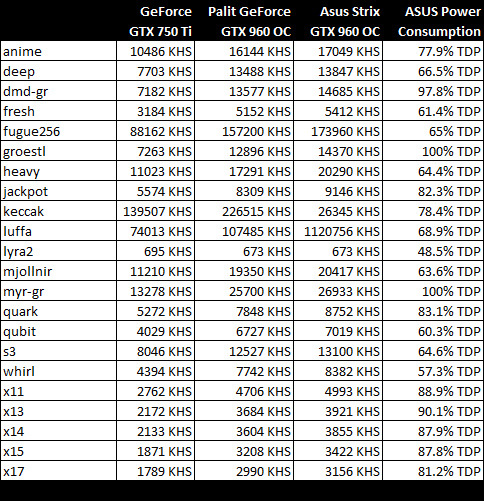 Do note that the Nvidia rated TDP of the GTX 960 GPUs is 120 Watts and it seems that the reference cards that are not factory overclocked are more like in the 100W of power usage and the higher clocked models such as the ASUS STRIX GTX 960 do manage to go up to the 120 Watts power consumption mark. We have used the ccMiner 1.5.31-git Fork by SP for Maxwell, the same version that we used a few days ago, so that we can compare performance with the GTX 750 Ti and the GTX 960 OC card from Palit to the results that the ASUS STRIX card offers. There is a newer version of the ccMiner fork from SP already available that fixes the NIST5 support, though there is not much difference in the performance in the Lyra2 algorithm on the GTX 960 as compared to GTX 750 Ti. Also the Blake, Blakecoin and Penta algorithms that rely a lot on the CPU and do not use much of GPU resources do not seem to provide much better results on the more overclocked ASUS cards. Other than that the ASUS STRIX card does provide some extra hashrate over the Palit GTX 960 and thanks to the higher clocks factory preset for the ASUS its performance gets closer to 2x the hashrate provided from a reference GTX 750 Ti GPU that is not factory overclocked. Today Nvidia has introduced a new mid-range GPU based on their latest Maxwell architecture – the GeForce GTX 960. Specifications wise the new GTX 960 is kind of half the parameters of the GTX 980 at about half the price, but it is actually more interesting as an alternative to GTX 750 Ti in our opinion. The Nvidia GeForce GTX 960 GPUs should provide roughly 1.5x to 2x the performance of a GTX 750 Ti being slightly more expensive and with 120W TDP according to the official specifications. 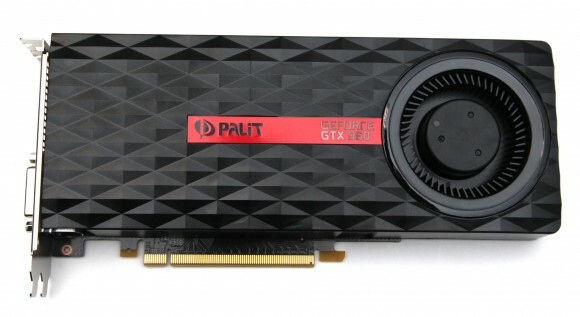 We have managed to get our hands on one GeForce GTX 960 from Palit, their reference-like design though it is still slightly overclocked version, but the lowest and cheapest version that they currently offer and have decided to compare it to the performance of a reference GTX 750 Ti card with no factory overclocking to see the difference in performance. 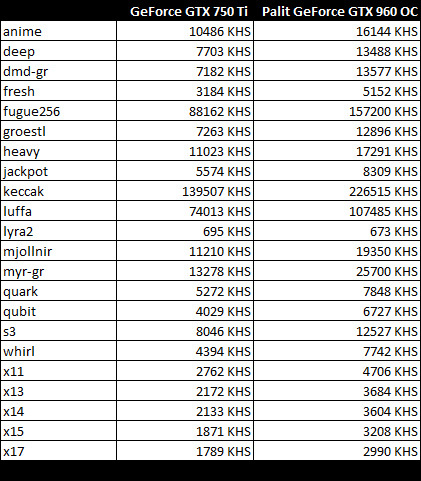 We have used the latest ccMiner 1.5.31-git Fork by SP for Maxwell to test on both GPUs and you can see the results in the table above. As expected the performance result from the GTX 960 we are seeing are in the range 1.5x-2x the ones that GTX 750 Ti provides. With a more serious factory overclocked GTX 960 results more to the 2x can be observed as compared to a reference non overclocked GTX 750 Ti GPU. There were however a few weird things that we have noticed and also the reason why there are no results from all of the supported algorithms listed in the table. 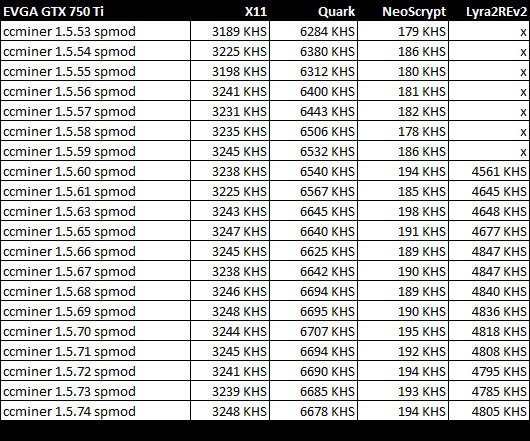 Lyra2 for example performs worse on GTX 960 than on GTX 750 Ti, it probably needs some optimizations to show the maximum potential that the GTX 960 can offer. NIST5 seems to be broken in the latest ccMiner fork as it did not properly work on any of the Maxwell cards, the Blake, Blakecoin and Penta algorithms provided too weird results and very significant difference between the two cards. So we have decided not to include them until further investigation on why the results are so strange and different for the two GPUs. Anyway, it seems that the GTX 960 could be an alternative solution for GPU mining instead of the GTX 750 Ti for mining rigs that use multiple video cards. That is if you consider investing in GPU mining rigs for mining crypto coins with the idea not to mine for profit at the moment, but to keep the mined coins expecting better times to trade them as currently GPU mining is not very profitable with the low exchange rates at the moment.